Here's what Digvijay Singh said in an interview with the Indian Express published on December 11, 2010: “On November 26, 2008, at 7 pm, just about two hours before the attacks in Mumbai started, Hemant Karkare, the slain ATS chief rang me on my mobile and told me how his family and his life were blighted by constant threats from people annoyed by his investigations into the Malegaon blasts." The remark became controversial, and Maharashtra's Home Minister R R Patil issued a statement saying there was no record of Karkare and Singh having spoken at the time mentioned. Now, Singh has produced telephone records which he claims vindicate his position. Except they do not. What the records show is that Singh called Karkare, not the other way round. It's a crucial difference. 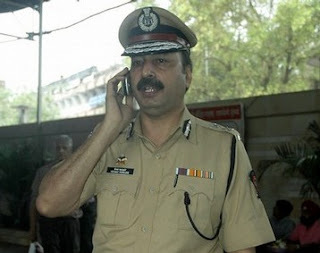 I don't like the idea of police officers contacting politicians to whine: I'd think less of Hemant Karkare if he'd done what Digvijay Singh said he did. However, if a politician calls a police officer he is acquainted with, it's perfectly acceptable for the policeman to mention in passing that he is being threatened. Moreover, we only have Digvijay Singh's word for what was actually said. If Singh could lie about who called whom, he could well twist the contents of the conversation. I've been very critical about the police in a number of posts on this blog. There are, however, a few perfectly honest, dedicated officers who stand apart within the force. Hemant Karkare was one of them. Digvijay Singh lied when he said Karkare called him the day he was killed. I hope newspapers and TV channels covering the issue highlight the difference between making a call and answering it. Something is wrong with the way news is being published. I read at 3 different channels, that someone from ATS (maybe karkare) had called. But, the call was made from an ATS office landline at 5.44 PM, unlike what digvijay is saying (7 PM).